Leader of the Islamic Revolution Ayatollah Seyyed Ali Khamenei says the so-called international coalition led by the United States and formed allegedly to fight the ISIS terrorist group has not been successful. 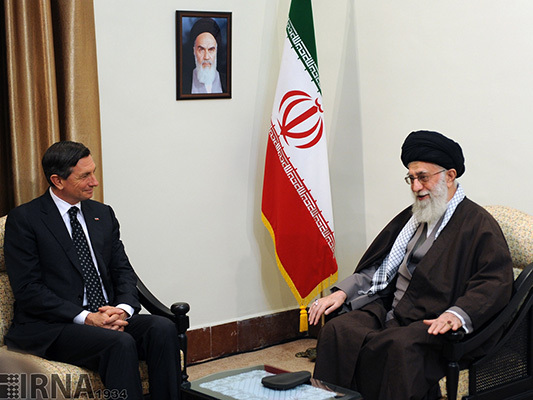 “Based on one standpoint, the Americans have no plan to uproot ISIS… and seek to act in such a way vis-à-vis ISIS that this problem would remain unresolved in Iraq or Syria,” Ayatollah Khamenei said in a meeting with Slovenia’s President Borut Pahor in Tehran on Tuesday. Iranian President Hassan Rouhani was also present in the meeting. “Based on the second standpoint, the Americans are keen on the settlement of the issue of ISIS but the mechanisms [used to achieve this goal] are not such that they would be able to carry out this task,” the Leader added. The Leader stated that violent clashes in West Asia and the creation of terrorist groups such as ISIS have been the result of acts of interference and imposition of the will by certain powers, adding that all countries are duty-bound to make efforts to settle such conflicts.